Synteko Retarder 1670 is intended to be added to Synteko Classic 1636 Matte 35, 1637 Semi Gloss 50 or 1646 Gloss 90 when large open floor areas need to be coated with Synteko Classic, or when the conditions are very warm and/or dry (low Relative Humidity). Addition of Synteko Retarder will help to improve the open time, flow and leveling of Synteko Classic under these challenging conditions. • The catalyzed Synteko Classic mixture may be diluted with up to 10% with Synteko Retarder. • The amount added depends on the jobsite conditions, e.g. airflow, layout and/or size of the floor to be coated. • First, mix Synteko Classic with the proper amount of Synteko Hardener as recommended on the Technical Data Sheet for Synteko Classic. 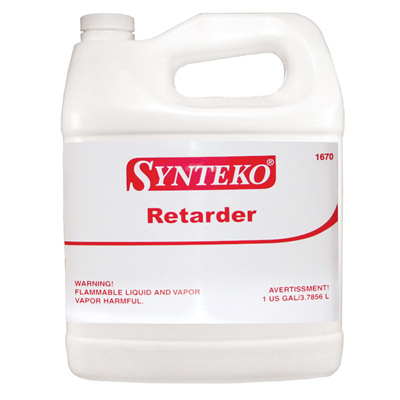 • Next, add up to 10% Synteko Retarder to the catalyzed Synteko Classic mixture and mix thoroughly. • Allow this mixture to stand for 5-10 minutes before use.